Josh Eichhörn: reserves the right to refuse service to anyone. Malcolm Dragon is held captive by the Great One, a monstrous entity of some importance amongst the Demonoids. A huge army of Demonoids surround them within the underground and watch on as their leader gets set to eat their prisoner. He warns that his plight would have been reported back by Frank Darling who used to date his step-sister. This means that the Special Operations Strikeforce has been deployed to rescue him and that that will ensure their defeat. Much to the surprise of the bluffing Malcolm, the newly-revamped S.O.S. burst onto the scene to launch a rescue mission. Battle Girl leads the way to liberate her younger brother as SuperPatriot opens fire on the Great One. The numerous superheroes pour forth to battle the Demonoids and they are eventually able to release Malcolm from his captor’s clutches. The S.O.S. then suggests that they retreat while they still can. The Great One is not keen on surrendering his prisoner though and bursts up onto the surface where the Chicago Police Department had been waiting. Malcolm is caught once more and is consumed by the Great One just as Maxine arrives on the scene. She witnesses her boyfriend’s apparent death as Scott Chow races to try and keep her safe from the emerging Demonoids. The S.O.S. follow the evil creatures back to the streets of Chicago and resume the fight. Horridus, Barbaric and Rock are all soon knocked out but the rest of the S.O.S. continues their assault. SuperPatriot does not stop firing into the horde of Demonoids but even as the corpses begin to stack up, still more join the fray. Malcolm suddenly punches his way out from within the Great One, killing the giant monster instantly. 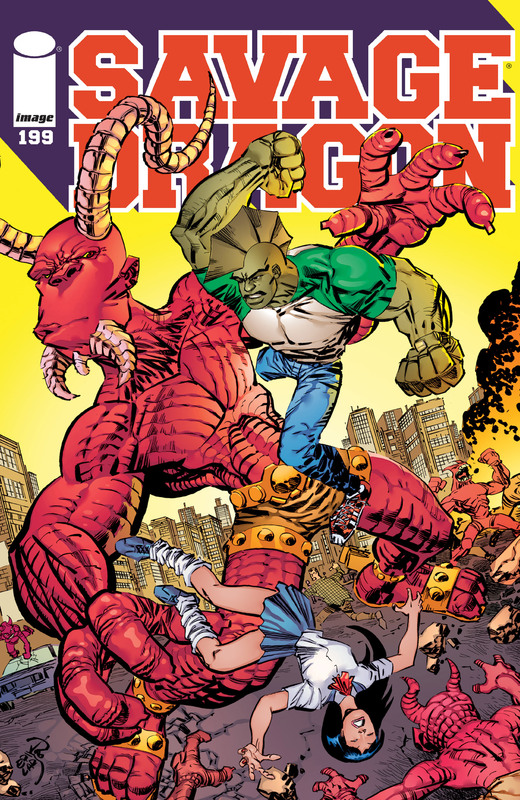 He then leaps to the rescue of Maxine, taking down a behemoth called Smashmouth. With their leader dead and their casualties continuing to mount, the Demonoids decide to stand down and retreat back into the underground. The various heroes deal with the aftermath of the failed invasion and discuss the wisdom of simply allowing their opponents to leave. It is decided that continued fighting would endanger too many innocents and it is easier just to let them go. Malcolm and Maxine are reunited and prepare to head off to begin their new life living together. Vanguard leads many of his remaining allies to the floating city of Konos where they are alarmed to discover the entire place devoid of life. Amok recognizes the city as where the Kalyptans once held him before launching him into space. He takes off, pursued by Lurch who is asked to watch over him. Modem enters into cyberspace in search of Wally before he is deleted by the Mekka-Drones that are presumably somewhere on Konos. Meanwhile, Galian uses his power staff to transmute all of the corpses of the Kalyptans, Tyrraneans and Krylans all over the planet into fertilizer for the planet. He then does the same with the various destroyed spaceships in the hope of healing Kalyptus. 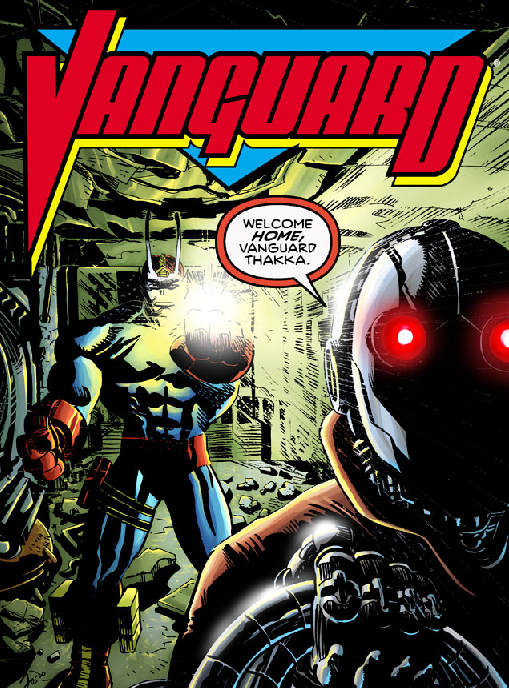 Vanguard heads out in search of the Mekka-Drones and finds one waiting for him in his family home. Modem suddenly appears to confirm that Wally has been taken prisoner but she is suddenly hit by energy fired by the Mekka-Drone that turns her into her original human form.